Saga Pearl II is the smallest of two ships owned and operated by Saga, the British company that offers a range of products and services exclusively for the over 50s. Built in 1981 in Hamburg's Howaldtswerke-Deutsche Werft shipyard for a German-owned cruise line, the vessel sailed under a variety of names until it was acquired by Saga in 2009 to replace Saga Rose. 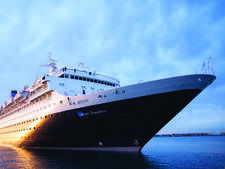 Saga spent more than £20 million renovating the ship, which was last refurbished in 2015, and it was renamed Saga Pearl II after the company's Saga Pearl, which was retired in 2004. A minnow compared with the size of many of today's mega-ships, Saga Pearl II carries 449 passengers in traditional style and is a very elegant-looking vessel with its teak decks and polished rails. There is no water park, flashy entertainment scene, celebrity chef restaurant, casino or any of the bells and whistles that you find on larger ships. But this is the very reason that Saga passengers -- affectionately dubbed "saganauts" -- love the vessel, many of them clocking more than 1,000 nights at sea to rise through the ranks of the Britannia Club loyalty programme to become top level Diamond members. A huge plus point for the high number of repeat passengers, and unique in ships of any size, is that almost 25 percent of the 258 cabins -- 57 in total -- are singles and carry no supplement. Aimed firmly at U.K. passengers (this is one line where Brits won't grumble about not being able to get a decent cuppa), meals include full English breakfast -- with Marmite, of course – roasts, curries, proper afternoon tea and Werther's Originals handed out on shore excursions. Saga takes care of everything from the thorny subject of tipping, which is included in the fare, and a huge host of extras that provide for a hassle-free experience. A complimentary chauffeur service, up to 250 miles each way, is provided for sailings from Southampton and Dover. Alternatively, passengers are offered rail travel, domestic flights with transfers or free car parking in the fare. On arrival at the dock there is a free porterage service. Standout onboard features include a vast library and -- above all -- outstanding crew members, who are unfailingly friendly and go out of their way to help passengers and make them feel at home. Saga also organises surprise "magic moments", which are never pre-publicised. On our cruise, which included excursions to the battlefields and wartime memorials of France and Belgium, this was a spectacular Spitfire flypast set against the poignant backdrop of the White Cliffs of Dover. 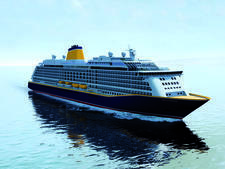 In addition to sailings out of the U.K., Saga also offers fly-cruises. For passengers looking for high levels of service and comfort -- plus plenty of inclusions in the fare -- Saga Pearl II is a gem of a ship. Saga sells holidays in the U.K. to the over 50s, although the majority of passengers are considerably older. That said, the majority are an energetic, well-travelled bunch and the ship certainly doesn't feel like a floating retirement home. Travelling companions of 40 and older are allowed onboard, which is useful for anyone who wants to travel with adult children and family members, or who might need assistance. The ship is almost exclusively British, but occasionally there could be a smattering of Canadians, Australians, New Zealanders or other English-speaking nationalities. There is a relaxed vibe during the daytime. However, Brits of a certain age don't do casual like some other nationalities, so the ship is virtually a baseball cap and logo T-shirt-free zone. During the day women wear casual trousers, jeans or skirts with short-sleeved tops, blouses or jumpers; depending on the weather. For men it's casual trousers, jeans or Bermuda-style shorts with short-sleeve and checked shirts or polo tops. The British default summer setting of socks worn with open sandals is a familiar sight, and of course nobody bats an eyelid. Evening dress codes for the restaurants are "casual" or "formal", with two formal nights on seven-night voyages and three on voyages of two weeks. To prevent any sartorial errors the evening dress code is shown on the front of the "Today" newsletter left in cabins, and it applies to both restaurants. Even on casual nights most passengers choose to dress up a little for dinner, with the accent on smart casual. Women wear smarter trousers and tops or dresses and, even though it is not required, many men wear jackets and ties or dapper blazers and cravats. On formal nights it is impossible to overdress. Women opt for glamorous long gowns or cocktail dresses worn with a sequined shrug or pashmina. Men don dinner jackets and bow ties or dark lounge suits. Saga has produced a light-hearted video offering a few dress tips, which can be seen on the website. The fun three-minute film features a pair of friends getting ready for various occasions on Saga Pearl II's sister ship Saga Sapphire. The Saga dress code guide concludes: "Wear a big smile and everything else will be plain sailing!" All tips and service charges are included in the cruise fare, and there are no automatically added gratuities on bar bills or for treatments in the spa, hairdressing and beauty salon. The onboard currency is British pound sterling.